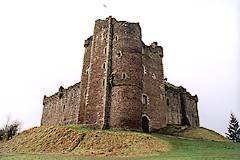 Doune Castle is signposted from the main road going through Doune and has a free car park next to it. The castle is in the care of Historic Scotland and, although there is an admission charge, you can walk around the outside for free. However it's worth paying the entry fee to look over the inside of the castle especially if you want to see the spots used as locations in the movies filmed there. Robert Stewart, the Duke of Albany and Earl of Menteith and Fife built Doune Castle at the end of the 14th century. Following his death in 1420 the castle was used for over a hundred years as a royal castle serving as a hunting lodge, country retreat and eventually a state prison. 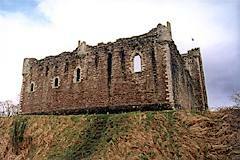 The castle was owned by the Earls of Moray from 1580 until the present time. The castle seems to have had a fairly uneventful history although during the 1745 rebellion it was captured by the forces of Bonnie Prince Charlie. The castle fell into disrepair in the 18th century and remained roofless until 1883 when the 14th Earl of Moray paid for the castle to be restored. It was placed into the care of the state in 1984 on a 999 year lease. Doune Castle is open all year round but is closed on Thursday afternoons and all day Friday during in the winter months. Opening times are listed on the Historic Scotland site.